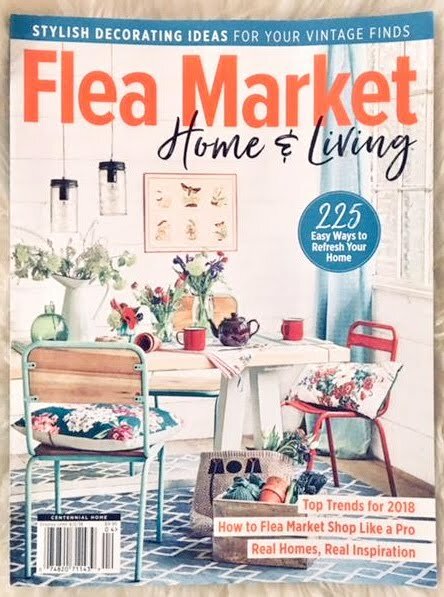 I can't speak for the entire nation, but in our neck of the woods, the Denver, Colorado area, patio sets are HOT items (from around March-October). They sell fast, and they sell for a decent amount, and they get a line of interested buyers. If you have followed my blog for awhile, you will know that I fix and flip all kinds of furniture. I have sold all kinds of furniture, plus all kinds of other items such as baby clothes, bikes, art, toys, sporting goods, you name it, and I have found that some categories sell for higher and faster than others. However, in all of my buying and selling of used items, primarily on Craigslist, patio sets sell the fastest with the most competition bar none. And this is all across the board...garage sales, Facebook for sale groups, Varage Sale, etc. 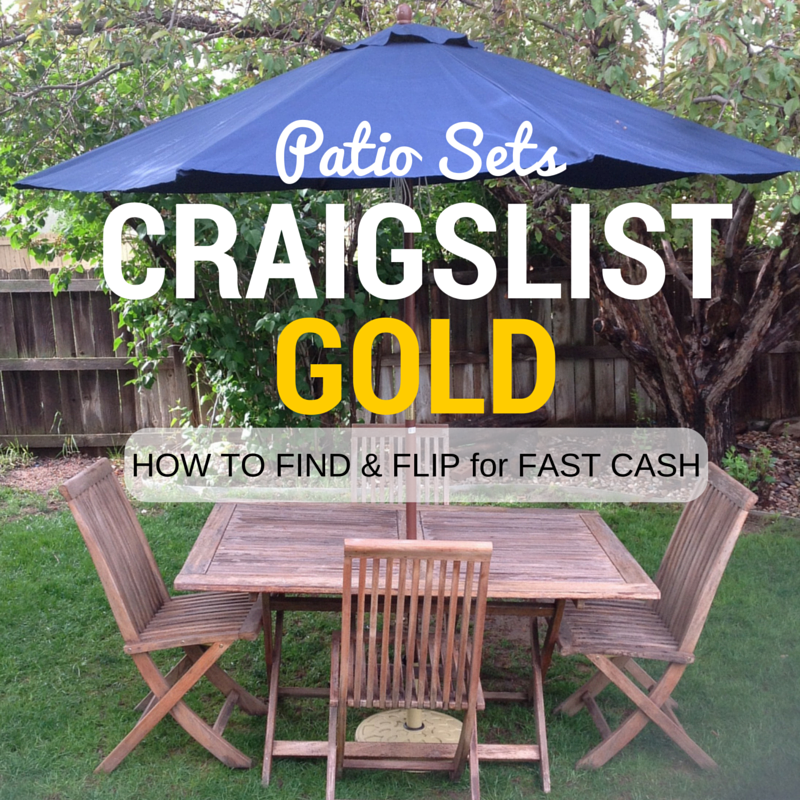 (FYI: Craigslist in our area has proven to be the best place to post patio sets for the quickest and highest price). If you talk to a few people and mention you are looking for a patio set in passing, before you know it you will have access to one at a steal of a deal. To sell his set, we put it out at a garage sale we were doing, and it was the main attraction. People driving by saw the basic set and had to stop their cars. It was sold within 10 minutes. (We in turn gave the money to our landlord, who in turn only took a small amount of the profit). I didn't know if I was pricing it too high, but after researching other local ads I figured I would give it a shot. I had a line of interested people within a few hours, and it was picked up that weeknight by someone that was willing to drive 45 minutes in the pouring rain. Crazy. 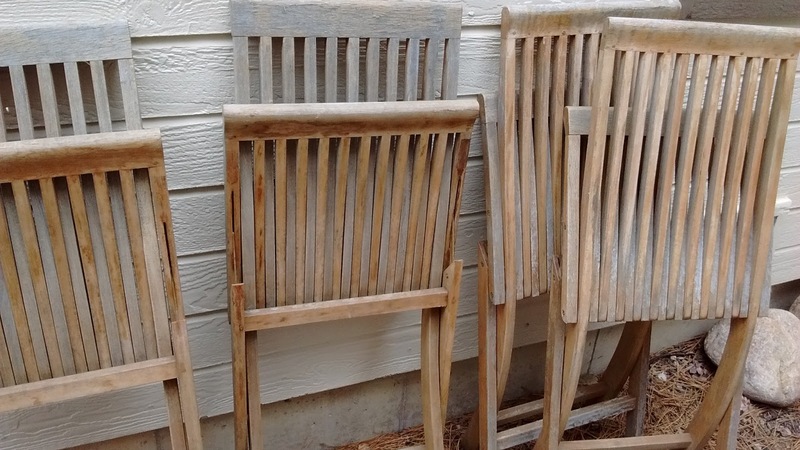 So if you saw these chairs, along with a similar looking table folded and lying on someone's grass at a garage sale, would you think, "Oooh, me first, me first!" Probably not. But if you had started realizing what I was realizing, you'd give it a second thought huh? I am not a garage sale shopper, but on a whim decided to drive through a community garage sale on my to the store.The sale had been going on for an hour or more, and at this home it was packed with people. This set was off to the side, away from most of the items for sale, and not one person was giving it a glance...except me. I checked it out and noticed that the teak was definitely weathered and needing some TLC, but knowing that patio sets sell like hot cakes, and this set was marked for $20, I bought it without too much thought. Teak sets are great because they are strong dense wood perfect for the outdoor elements, and so they sell for a good amount. I figured I could make my $20 set beautiful again. So I could have staged it really quickly and sold it easily in it's "weathered" state; however, I knew if I "staged" it better I would make more. So I went online to jet.com (an awesome new website trying to rival Amazon), and bought a 9ft umbrella and an umbrella base, amounting to $60 total (free shipping and free returns in case it didn't sell, or someone wanted it without an umbrella). 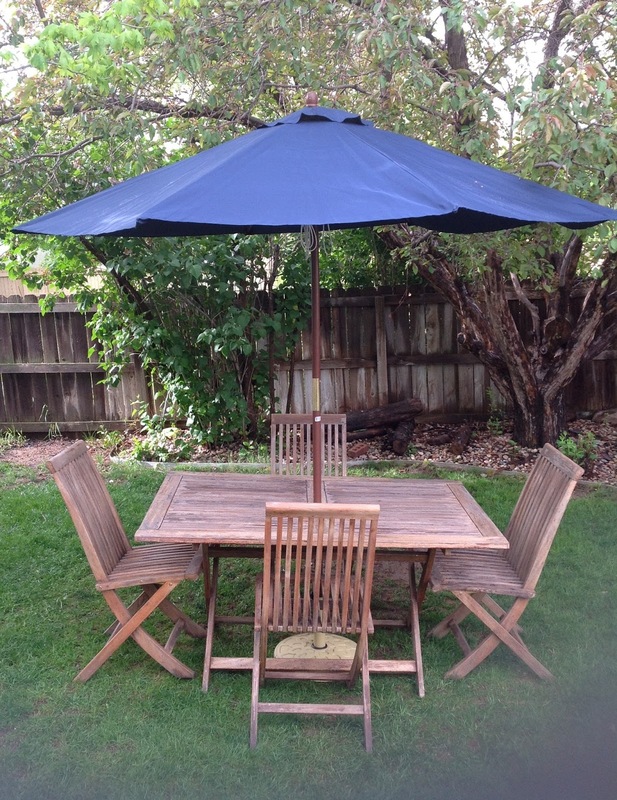 I had found that every time I sold a patio set in the past, that the buyer asked if there was an umbrella included. I had always said "no", which never dissuaded them from buying, but I could tell they were always a little bummed. So this time I would give the people what they wanted. A complete set all done for them. Easy is the road everyone wants. I staged the set just before a storm hit, and un-packaged the umbrella and base just for the pictures. (I did all of this in our backyard in my bathrobe one morning, which was probably quite a site for all of our neighbors). ...and had a guy text and email me (within 20 minutes) with urgency that he get first dibs on the set. He arranged to pick it up at 1:00 that day, and was willing to drive a distance (in bad weather again) to get it.. Awesome I thought. And then I got phone calls, texts and emails with 9 other people begging that I let them come get it before 1pm. Wow. I should have listed it for more. However, I had only spent $20 on the set + $10 on Teak Oil (which I didn't use properly I guess) + $60 for the umbrella set. That was $160 profit so I didn't think I could've asked for more. Oh well, next time. So before I wrap up my post, I will finish by mentioning what happened to the first set we bought at another garage sale when we first moved to Colorado 5 years ago. It was a nice wrought iron, 4 seater set, complete with placemats and a candle. The older couple was selling it for $30 and I just happened to be at the right place at the right time to get that picture perfect set. After using it for more than 4 years, damaging one of the cushions from putting it in our washer, the elements making the set dirty and bleached from the sun, I turned around and sold the set for $100 (on Craigslist) without the pretty placemats or candle. The buyers picked it up the weeknight I had posted it, within a couple hours (with plenty of interested backups). Once again, could've sold it for more. (Note: I italicize weeknight because weeknights are not the best time to sell on Craigslist. More shoppers are shopping on Friday, Saturday and Sunday, so the fact that I get a line of interested shoppers on a weeknight shows how many people are looking for patio sets). Shop garage sales, don't be dissuaded by less than picture-perfect sets. Talk to acquaintances, let them know you are looking for a patio set. And shop other online avenues such as the Facebook for sale pages, or Varage Sale. They have smaller audiences and thus can be listed for quite some time and can be "talked down" on price. Also, sometimes people are just getting rid of things for a steal and you happen to be the lucky one first in line. Then, when selling, post your "staged" set on Craigslist. Doesn't have to be fancy, but put the set in the best surroundings you have, and take a decent picture. In the end patio sets are what a lot of buyers are looking for. Low supply and high demand means you can sell a non-fancy table quickly and easily.